First published in 1963, C. L. R. James’ Beyond a Boundary transformed not just the study of cricket but also the wider field of the relationship between sport and society. Hailed at the time by no less an authority than the quintessential voice of the game himself, John Arlott, as the ‘finest book written about the game of cricket’ (18), the trailblazing volume has become required reading in academic disciplines as diverse as aesthetics, cultural theory and sports studies. Not the least remarkable aspect of James’ study was that the author applied decades of personal activism and theorisation within the revolutionary Marxist movement to his appreciation of what many had hitherto regarded as a sport virtually synonymous with the norms and values of the British ruling class. Even without Beyond a Boundary, James would still be recognised today as one of the most creative and fertile minds to have been produced by the Trotskyist tradition. Intriguingly, it was perhaps his encounter with Hegelian dialectics in the 1930s that equipped him to adopt a historicised and nuanced approach to the dynamics of sport that had never occurred to any previous analyst. His crucial insight was to perceive that cricket’s translocation to the territories of the British Empire, including his native Trinidad, had unwittingly provided oppressed populations with an outlet to express their resistance to imperial hegemony. As his protégé, Stuart Hall recalled: ‘James often remarked that the British said the Empire was won on the playing fields of Eton and would be lost on the playing fields of Lords cricket ground’ (8). Over half a century later, Beyond a Boundary remains the most important study of sport to have emerged from within the tradition of historical materialism. However, in the decades following its publication, there have been multiple theoretical paradigms, such as feminism and postcolonialism, which have emerged to add layers of interpretation to our understanding of sport and its function in late capitalist society. 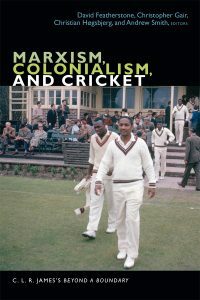 The authors of Marxism, Colonialism and Cricket usefully set themselves the task of trying to integrate the insights offered by these and other perspectives with the pioneering vision developed by James in a bygone era. The collected papers are linked to a conference held at Glasgow University in 2015 to mark the 50th anniversary of James’ seminal text. Impressively, the authors are respectful of James’ pivotal contribution to the Marxist analysis of sport but also explore aspects of his thought that fall short of a fully comprehensive materialist approach. The editors’ introduction notes: ‘James was certainly guilty of ignoring the exclusions that structured cricket as it was played, especially the heavily gendered nature of the sport and it is also the case that his account seems oddly inattentive to class’ (15). The contributions range from contextualising James’ work in the contemporary milieu of the struggle for West Indian political unity, to the uncertain future of cricket in our own age of globalisation and neoliberalism. An explicitly Gramscian methodology features surprisingly infrequently but the spirit of the Italian Marxist’s desire to connect the heights of abstraction with the quotidian experiences of the oppressed at work and play permeates all the contributions. For example, Andrew Smith’s illuminating essay considers how the dialectical relationship between the universal and the particular can help us understand how certain personalities seem to transcend the boundaries of their sport and take on world-historical significance. Smith’s ingenious starting point is that there is a sense in which every cricketer, by definition, has to be a materialist of sorts; the requirement to assess the ongoing interactions of the pitch, cloud cover and moisture in the air on the trajectory of the ball is crucial to the outcome of the match. Furthermore, Smith persuasively contends that a Hegelian perspective can help us grasp why millions of people derive genuine pleasure from viewing the duels between players of the highest calibre. The appeal, he suggests, of ‘cricketing play is part of a historical zeitgeist that is bound up with and gives expression to the sociological order in which that play occurs’ (193). The dialectical principle of quantity evolving into quality is apparent in ‘moments of improvisation that come to form new styles of play-however tiny and inconsequential they may appear in their own right’ (192). Smith even suggests that cricket, along with all forms of sport, can teach us valuable lessons on the nature of the revolutionary process. The outcome of a match is the dialectical combination of pre-determined factors such as the relative skill and ability of the two sides acting as respective units, with the contingent capacity of certain individuals to shape the game according to their will to win. Extrapolating to the spheres of history and politics, Smith suggests this parallels the outlook of classical Marxism that the success of revolutions depends on the crucial interplay of objective and subjective conditions. It is not sufficient for the system to be in crisis; a coherent alternative has to be feasible and deliverable. This indispensable feature of the game, Smith argues, is what might be called the ‘anti-determinist quality of cricket’s dramatic structure, in which a seemingly foregone conclusion can be undone by a moment of spontaneous brilliance or by a period of sustained counterattack’ (194). James’ conviction as a Trotskyist that revolutionary moments can hinge on the acts of small groups or even individuals located in strategic positions was attuned to the belief of the movement’s founder that without Lenin and himself being present in Petrograd, the seizure of power by the Russian working class in 1917 would not have taken place. Smith expands on this imaginative line of thinking to address wider issues of how Marxism should approach key questions of aesthetics and human nature. Citing the bowling actions and batting strokes of the game’s greatest players, Smith ruminates on how historical materialism can explain the reasons their prowess lives on in the memories of spectators long after the event. There might appear to be an incompatibility between the aforementioned idea that the great players, in some way, encapsulate the mood of an era, and the more elitist notion that outstanding athletes conform to a transhistorical template of physical excellence. Smith creatively argues there is a way in which these apparently incongruous perspectives can both be assimilated within a Marxist framework. Although it is indubitably the case that the myriad of cultures throughout the span of history have devised a plethora of conceptions of human beauty, what unites them is a desire to overcome the limitations of circumstances and to aspire to a level of performance that transcends the social norm of the time. Although neither James nor Smith utilise the concept of alienation in their accounts, what they both seem to be implying is that the great practioners of cricket, and any other sport, unconsciously point to the possibilities of non-alienated labour in a future socialist society. In the powerful words of the latter: ‘The freedom that the best players of human games reveal is their ability to turn the more-or-less arbitrary constraints of the game into a mode of expression … the possibility of human freedom in its wider, political sense: the capacity of human beings to make and remake themselves and their world’ (202). James famously observed in Beyond a Boundary that doubters of the significance of sport in social and political matters had written histories of nineteenth-century England without mentioning the person who, according to him, dominated the consciousness of the working class of the age: W. G. Grace. In the text, James made a case to regard this legendary figure of the game’s early history as a pivotal figure in the country’s transition from land-owning oligarchy to parliamentary democracy. In this volume, Neil Washbourne critiques Grace’s progressive credentials and suggests, contra James, that the cricketer was in fact deployed to consolidate a reactionary agenda that suppressed the emancipatory impulses of the late Victorian era. Washbourne points out that 1895, the annus mirabilis of Grace’s career in which he scored his one-hundredth hundred, was also the year of the trial and incarceration of Oscar Wilde. The newspapers of the day, as the hegemonic mode of communication, intentionally lauded the heroism of the former as a contrast with the putative depravity of the latter. As Washbourne puts it: ‘Grace’s image was used, as the healthy, masculine, outdoors counterpoint to Wilde’s perverse, unwholesome, indoors mentality’ (145). In James’ understandable desire to foreground Grace in the face of neglect by mainstream historians, Washbourne perceptively suggests that the writer overlooked the role of mediation; in other words, the manner in which the image of a public figure is often shaped by the needs of the elite in a particular age. Clare Westall constructs a dialectical and materialist analysis of another player from the pantheon of the game, which is slightly more sympathetic to the Jamesian paradigm. Gary Sobers, the West Indian captain and all-rounder of the 1960s, rose to prominence in an era in which the fragmented islands of the Caribbean were moving out of the shadow of empire and groping towards federated status. Sobers is assessed by Westall as the personification of the liberated and optimistic mentality that characterised the mood of the people in the region at that time. Again, the centrality of the Hegelian dialectic is emphasised for comprehending the impact of a particular player and how he (or she) expresses the zeitgeist. Describing Sobers’ distinctively cavalier approach to the game, Westall observes: ‘He is enacting a mode of beautiful, recognisable and perfected attack that connects him to the long history of Caribbean rebellion and positions him as fundamentally arising from, and connected to his community’ (188). This thoughtful reformulation of the significance of a sporting great, along with the other highly readable contributions to this volume, illustrates that Marxism has much to offer the analysis of sport in the spirit of the great Trotskyist from Trinidad. Without wishing to make a polemical point in response to what is in many ways an illuminating review of a book about a fascinating subject, I think it is fair to say that the later James himself would have bristled at the notion of being hailed as a “great Trotskyist”. James was undoubtedly that during the thirties but had, at least in hos own estimation, outgrown that tradition by the forties (whatever his estimation of the personal qualities of Trotsky). The dialectic, as Marx once wrote in a rebuke of Lasalle, has to be uncovered within a specific subject matter rather than being imposed upon it. The dialectic of Carribean cricket which James showed us continues to unfold today, as is shown by recent discussion among cricket journalists and cricketers (such as the England fast bowler James Anderson) on the current England tour of West Indies about how motivated the West Indian cricketers always are to do well against the old colonial power.